Have you guys ever played Angry Birds? 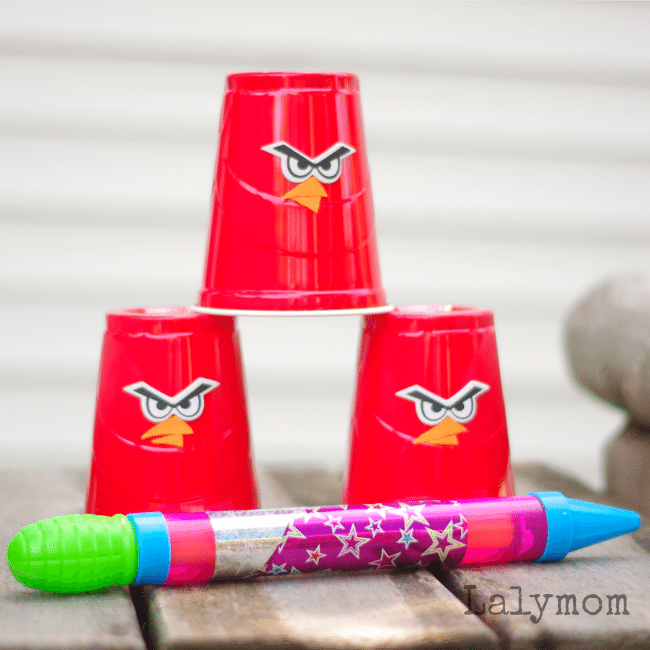 Well today we are sharing how we made our own, easy peasy DIY Angry Birds Knock Down Game. 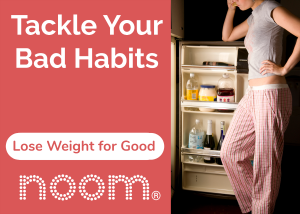 There are a couple affiliate links in this post, FYI. My kids recently learned of the Angry Birds apps and think they're super hilarious. I was sitting around one day and remembered our Fire Cups Knock Down Game and thought, oh I could totally adapt that to make some Angry Birds. This activity is actually straight out of my new book Pop! Squirt! Splash! 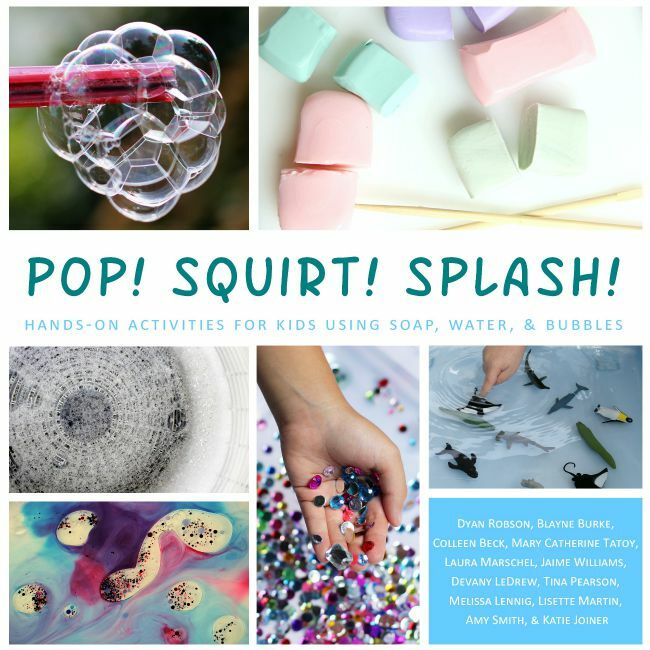 Hands-On Activities for Kids Using Soap, Water, & Bubbles. You can check out more details below or on Amazon! Now wait- have you come here to point out my obvious oversight? Did you even notice? I know. I KNOW. The birds are NOT the targets. The birds are the ammo. Oh well! Life goes on! We still had fun with it. If you can get past it, I invite you to check out the super simple tutorial to make your own super silly, super squirty Angry Birds Knock Down Game. 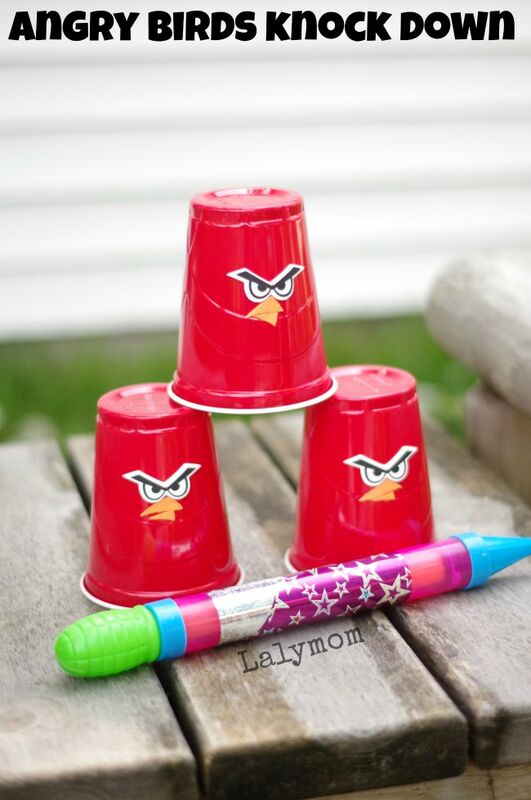 It would be perfect for an Angry Birds Birthday Party or just a hot day in the back yard! Materials note: I'd suggest hot glue or some other extra strong glue. We used glue stick just to get it done and after an afternoon of playing, the kids squirted the beaks right off! Ha! Grab as many cups as you want, we made three but older kids would probably like more. Take your red cups and add the googlie eyes. Cut two obtuse triangles of foam or felt (one slightly larger than the other) for each cup and glue them on as beaks. Set aside to dry. Once the cups are all dry, head outside and fill a bucket with water. Take turns stacking the birds up, loading your squirt guns and water blasters with water and go to town to squirt them down! Stacking the cups alone is a lot of fun but to extend the activity add in additional materials for building larger and more challenging structures. 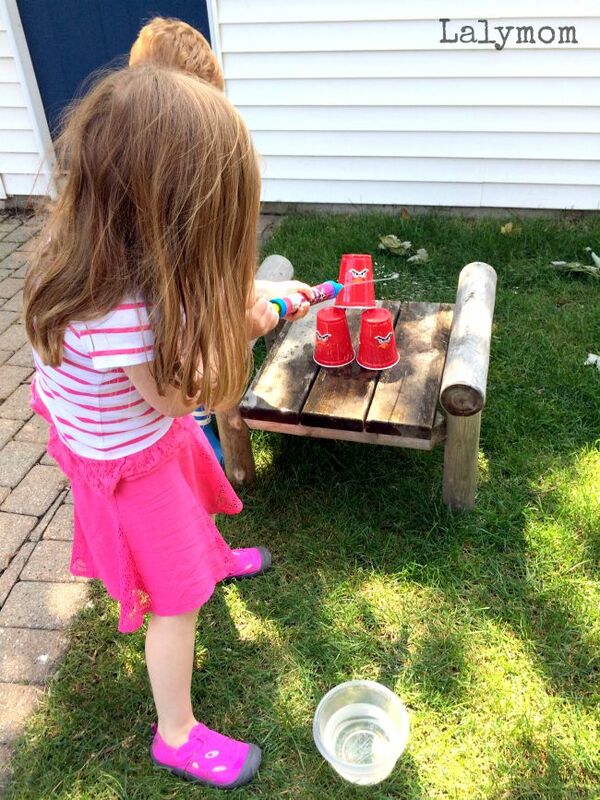 Craft sticks can be fun, but you can also raid your recycle bin, use mega blocks or any other waterproof toys. You can also make one bird from another color and try out your target practice skills. Stack the cups and try to knock down the odd colored cup only. As your kids play, they may come up with their own ways to play just like mine did. For more simple, silly, super fun play ideas, check out my new co-authored book Pop! Squirt! Splash! Hands-On Activities for Kids Using Soap, Water, & Bubbles! It's a great collection of simple play ideas using all sorts of things you probably already have around the house. We had so much fun with our activities and cannot wait to try those from my co-authors! 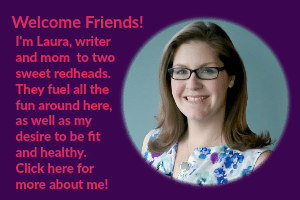 Here are a few more sneak peaks from my co-authors so you can get an idea for all the fun packed into our book!